The brewing temperature should be between 85 °C and 95 °C. The coffee would be burnt at a higher temperature. Each coffee has its own temperature, therefore there is no exact temperature information. The ideal brewing pressure alternates between 8.5 and 9 bar. However, a lot depends from the machine that means one generally cannot change any settings for the given pressure. The carbonate hardness of the water is decisive. It can be calculated out of the sum of the calcium and magnesium carbonates. It is usually expressed in parts per million or in degrees KH. For the preparation of espresso water of 6 to 8KH is especially suited. At smaller values the water is too soft and the espresso then tastes too acidulous. In case of a higher value, the water is too hard and leads to calcination. The same coffee prepared with the same settings can taste completely differently from one day to the next. A reason for this might be the changing humidity. This can for example be resolved by a change of the freeness. The dosage (the amount of coffee powder) for an espresso alternates between 7 to 9g. The extraction time is about 25 to 30s and depends on the coffee. These two parameters can be regulated by the freeness. The smoother the powder is ground, the longer the extraction time is. The more crushed the powder is, the shorter the extraction time is, too. If the foam is dark brown and if it shows a white spot or a dark whole in the middle, the espresso is over extracted. A reason for this might be that the coffee is ground too smooth or the amount of powder is too big. It might also be because of a brewing temperature which is too high or a brewing pressure which is too high. An under extracted espresso has a light and not much consistent foam which is a result of a particularly extraction time which is too short. This comes up because of an amount of coffee which is too small or  in most cases- because of powder which ground too crushed. Occasionally it is because pressure or temperature is too low. During the act of brewing water searches the way of the smallest resistance. If it is pressed irregularly or askew, the espresso flour is not interfused equally (channels are a result of that) which has a very strong effect on the quality of the espresso. The contact pressure should be between 15 and 20kg. With the help of a tamper the espresso flour is compressed and at the same time, an even surface of the pomace. Of course, the freshness of the coffee is crucial for the quality of the espresso. The coffee should be ground directly before the preparation as the taste and the aroma would get lost otherwise. The aroma of the ground powder lasts 7 days at most. One should also put into consideration to clean the mill regularly and to clean it from all remaining powder. 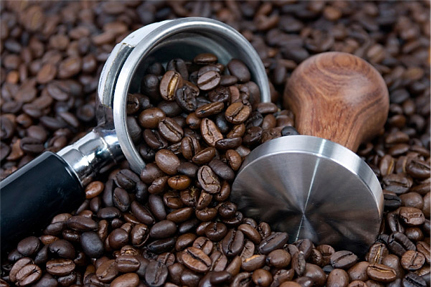 Because of the variety of influencing factors, the difficulty of preparing the perfect espresso can be seen. To keep the quality of the espresso in the cup some time longer, the cup should be preheated. Unfortunately, this is also done wrong very often. Indeed it is common to preheat the cups, but unfortunately the wrong side of the cup is normally preheated. Mostly the oral cavity of the cup is heated. Normally the ground of the cup should be kept warm as gravity leads the coffee into the lower region of the cup. Americano: an espresso diluted with water. The same amount of water is added to the normal espresso. Corretto: espresso with a shot of anise, sambuca, amaretto or grappa. Macchiato: espresso with a shot of milk-foam.